Door pulley exercise sets are exercise systems perfect for the home or office that our great rehabilitation devices if you are recovering from injury, surgery, and work to improve the flexibility, mobility or strength of your body. These exercise pulleys easily attached to doors (not sliding ones though) and quickly set up, usually in under a minute. They are able to provide bilateral exercise so that you can be assured of symmetrical results. Plus it comes from the great Drive Medical brand, so you are assured a quality product. In general, these are pretty simple products, so there's not a great deal to say about them. Other than getting a defective product, there's not much risk- but Drive Medical has received the most positive feedback of all the pulley systems we've examined. So we are confident recommending it to you! They are often used to help increase your range of motion if you are suffering from rotator cuff injuries, frozen shoulders, tendinitis, arthritis or capsulitis and bursitis. Let's take a look at 5 of the best-selling shoulder and arm door exercise pulleys on the market today. 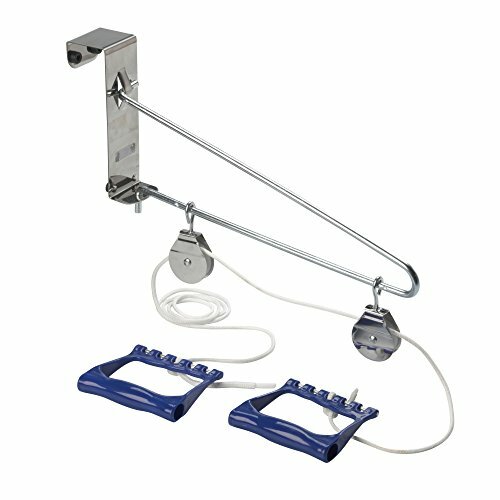 Many users purchase door pulley exercise kits because they have been using them with a physical therapist and want to continue their rehabilitation practice in their own home or office. They provide an ideal method of exercising the shoulders and upper arms, especially post-surgery and for those recovering from painful injuries. Small and lightweight, they're not a nuisance to set up and store away, with many users writing that they just leave them hanging over the door to use whenever they feel like doing a stint of rehabilitative exercise. In order to get started and install- all you have to do is place a strap over the door with the buck all aligned on the opposite side of the door. Make sure the doors close tightly. And then you will pull the strap towards you to make sure that it's securely locked-and then you're all set to go in use your exercise pulley. As you perform the door pulley exercises, some physical rehabilitation specialists advise that you think of the arm as a type of lever. The shoulder blade as well as the top of the shoulder should sort of drop down and then scoop away from your spine. If you experience any pain while you are performing rehabilitation exercises, try rotating your hands into different directions and positions and see how that feels. The effect of this is that the different hand positions will actually adjust your shoulder position as well- keep experimenting until you don't feel any pain. If you're looking to purchase a door exercise pulley system- check out our comparison table to review the best options for you. Some of the more common shoulder exercises include shoulder flexion, shoulder abduction, and shoulder internal rotation. Most users wrote that they are easy to set up and that they resemble the exact devices that their physical therapists use in their facilities. Most were pleased with how inexpensive anti-quality used to exercise the pulleys are. They let you work at your own pace and in line with your own ability. If you are suffering from a frozen shoulder many users write that it's a great way to get a satisfying and pain-relieving stretch. One user who purchased the Duro-Med Shoulder Arm Exercise Pulley Set, was enraptured by the amusingly dated photography used to advertise the exercise pulley set. Her physical therapist had recommended she purchase one of these door pulley exercise kits after experiencing frozen shoulder post mastectomy. It shipped pretty quickly, it was easy for her to install over her bathroom door, and enabled her to start a regimen of home-based rehabilitative physical therapy. With only the ability to use one hand, she found that it was highly effective and is helping her to develop the use of both arms. Another user was similarly satisfied with his DuroMed purchase. He had had a shoulder injury, something similar to a rotator cuff injury and had had his shoulder in a sling for over six weeks. He really had to do some heavy-duty therapy and while he loved the device, after extended use the rope did wear out, which he said was expected. He ended up purchasing a paracord that was the right diameter and found that this was a highly durable replacement. After extended use he went from basically having zero range of motion behind his back to a much greater range of motion that is enabled him a higher-quality of life as a result. If you have a shoulder injury you will suddenly become aware of how important this joint is for daily movement and activity. You will realize that simple activities like signing a check or reaching into a shelf in your kitchen will suddenly become prohibitively painful. The shoulder is actually your body's most mobile joint- and it is imperative to keep muscles that support it as strong as possible throughout your life. What is the shoulder girdle? The shoulders are actually comprised of three separate joints that effectively attach your torso to your arm. Muscles and ligaments affix these bones in place and are what provide the exceptional range of mobility healthy people have in their shoulders. Since this joint is so incredibly mobile, physical training should provide balanced support to keep these incredibly dynamic muscles strong and equipped with stable ligaments. It may help to visualize all of the different muscles that cradle your shoulder as a sort of girdle. Over the door pulleys enable you to experience pain-relieving, range-of-motion strengthening and stretching exercises for the shoulder. Because you are able to effectively control the active assistance- you will always be in full control of the exercise and assured that you do not aggravate the painful shoulder condition that you're suffering from. 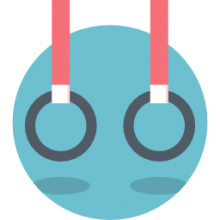 If you're looking to understand the range of different exercises you can do with your over the door pulley, consult with your physical therapist or the personal trainer you have been working with to understand the best exercises for your particular medical condition. It's crucial that you use the correct form and technique as you operate your pulley- when you pull the arm down, you should experience the muscles located beneath your armpit as well as those in your upper back activate, and have the shoulder blade point down towards your spine and the floor as you perform the range of movement.